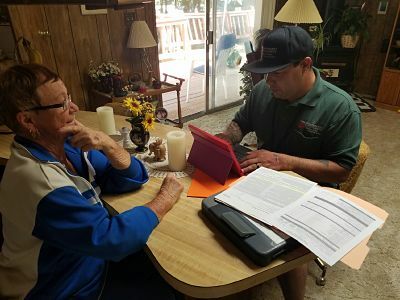 The Butte County Community Action Agency’s weatherization and energy savings program is committed to helping lower income families ensure that their homes are energy efficient and safe. Every day, our team reaches out to present the program and opportunities to help qualify participants. From air sealing to improving ventilation to adding insulation, Community Action Agency's Environmental and Energy Services reduces costs for low-income households by increasing the energy efficiency of their residential homes, while ensuring their health and safety. As part of the weatherization program, technicians perform energy audits on homes to determine which energy measures are most appropriate and cost effective for each home to reduce energy costs for low-income families. What better way to celebrate National Weatherization Day than to share personal stories of people we have helped. One of our team members, Ricky, recently met with a 78-year-old German woman named Gisela who lived through WWII. He learned that she was 13 when the bombs were dropped on Germany. Gisela’s home qualified for some energy upgrades and here at the Butte County Community Action Agency we were thrilled to provide them to this amazing survivor! Now that the work is done, Gisela will experience the benefits of lower energy costs and more efficient heating and cooling in her home. Jim received wood pellets through our HEAP program to help heat his home. The wood pellets were delivered to him, and the gentleman even stacked wood for him. Jim was just put on oxygen, so was especially grateful to the assistance and the help he received. He’s been using HEAP for a couple years now and it very appreciative to all that we have done for him. “The amounts of my last two PG&E bills [decreased]. While temperatures were a little warmer through the end of February and the first of March than they were during the months of November and December, I do not think that entirely accounted for a $37+ decrease in my utility bill. Without a doubt the credit goes to Butte County Community Action Agency for their help in repairing my furnace and installing a new thermostat. I am so appreciative of the bonus I am receiving because of your intervention; it’s allowing me to better stretch my dollars." Zach from our Weatherization team spoke with an elderly woman in Chico about our HEAP and WX programs. She was in need but very adamant about not wanting to take a “hand out.” Zach spent 45-minutes explaining to her that these programs are not handouts. Everyone is taxed small amounts on their energy bill which goes into this program. He explained that she has been paying into this program her whole life, and this is just her getting back the help she deserves and needs. By the end of the conversation she was in tears, and was so grateful and thanked him profusely for what we were able to do for her. By helping her with her PG&E bill, we enabled her to have more money for nutritious food and other necessities, while the weatherization program also helped her save money on her energy bill by making her home more energy efficient. At the Energy and Environmental Services division of Butte County Community Action Agency, we can’t think of anything we would rather do than help people improve their lives. Less money committed to staying cool in the summer and warm in the winter means more money for food, clothes and other household necessities. Since 1967, the Community Action Agency of Butte County has been serving the needs of the region in alignment with the charter of the National Community Action Agencies overarching goal: To alleviate the causes and conditions of poverty by whatever means necessary in your community. As Butte County CAA, we provide hope to people struggling with poverty to become more self-sustaining by meeting tangible needs in the areas of energy savings, affordable food, and housing. Connect with us to find out how you can get involved.